In modern education various information systems are used to support educational processes. In the majority of cases these systems have logging capabilities to audit and monitor the processes they support. At the level of a university, administrative information systems collect information about students, their enrolment in particular programs and courses, and performance like examination grades. In addition, the information about the lectures, instructors, study programs, courses and prerequisites, are typically available as well. These data can be analyzed from various levels and perspectives, showing different aspects of organization, and giving us more insight in the overall educational system. From the level of an individual course we can consider participation in lectures, accomplishing assignments, enrolling in midterm and final exams. However, with the development and increasing popularity of blended learning and e-learning, information systems enable us to capture activities also at different levels of granularity. Besides more traditional tasks like overall student performance or drop out prediction, it becomes possible to track how different learning resources (videolectures, handouts, wikis, hypermedia, quizzes) are used, how students progress with (software) project assignments (e.g. by analyzing svn commits), self-assessment test and questionnaires, etc. 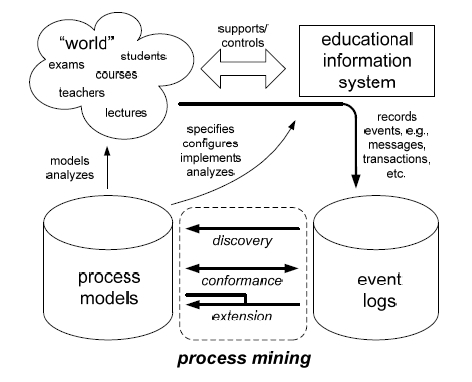 In our research we work on adopting existing process mining and data mining approaches for solving various educational data mining tasks as well as developing new algorithms and techniques tailored to the educational domain with a particular focus on integrating domain knowledge in the mining process. We mine educational data accumulated in different data sources including but not limited to administrative databases, learning manahement systems (LMSes) supporting blended and e-learning (or e-health), intelligent tutoring systems (ITS) and adaptive educational hypermedia (AEH) systems. We are interested in developing an open source software package EduProM (on the top of the ProM) to make data and process mining easy for educators and other researcher working in EDM. 10 questions and answers about CurriM can be found in this blog post. You may be interested in CurriM GUI demo. Surf maintains a webpage with the main info on CurriM pilot. A couple of notes about CurriM have appeared in Surf magazine and in Netkwesties.nl. Surf prepared 14 min, 7 min, 2.5 min video summaries of learning analytics pilot projects funded by Surf. Another interesting area we explore is stress analytics in education. Students are exposed to different kinds of stress, especially during the difficult studying periods like final exams weeks or project deadlines. We aim at providing means to students to become aware of the past, current and expected (objectively measured) stress and its correlation with their performance, to understand their stressors, to cope with and prevent stress - thus, to live healthier and happier lives and better organize their studies. You can read about this project idea from this short paper. Romero, C., Ventura, S., Pechenizkiy, M. & Baker, R. (Eds.) (2010) Handbook of Educational Data Mining, Chapman&Hall/CRC Data Mining and Knowledge Discovery Series, CRC Press, Taylor&Francis Group. 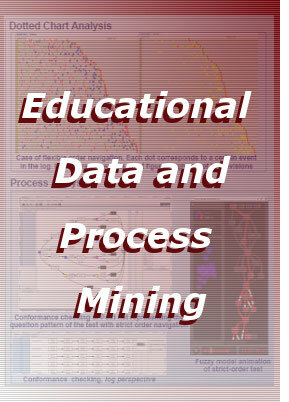 Trčka, N., Pechenizkiy, M. & van der Aalst, W. (2010) "Process Mining from Educational Data", In Handbook of Educational Data Mining. Dekker, G., Pechenizkiy, M. & Vleeshouwers, J. (2009) Predicting Students Drop Out: a Case Study, In Proceedings of the 2nd International Conference on Educational Data Mining (EDM'09), pp. 41-50. [BIB] [PDF]. Extended version is available as an internship report.